USC Spa Archives - CalAsia Construction, Inc. | CalAsia Construction, Inc.
Hey Trojans, here’s some Beauty 101: All of that study sesh caffeine ain’t so great for your epidermis, and while you might lose sleep over wallet woes and endless exams, at least your skin won’t looked super stressed. 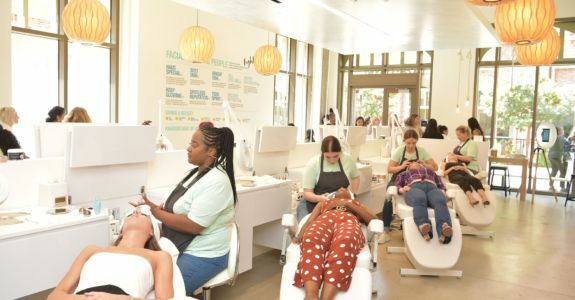 Budget-strapped students can now treat their visages on a dime at Face Haus, which opened its fourth fast facial bar in LA just north of campus at USC Village. Face Haus was co-founded in 2013 by good friends Karey Burke (EVP Programming and Development at Freeform), Dawn Olmstead (Co-President of Universal Cable Productions and Wilshire Studios) and Jenn Worley, (Current Face Haus Chief Creative Officer). While growing both kids and lucrative careers, the powerhouse, working moms were inspired by one daughter’s ‘first facial’ party that broke the bank. They realized there were no good, affordable skincare options for teens, men, or busy women.